The MVHS AGM was held on Wednesday 15th August. Management and Committee members are as follows… Neale Greenaway, President, Terry Tournoff and Leon Poulton Vice Presidents, Secretary, Kathie Bell and Treasurer, Lesley Poulton. Other Committee members are Robyn Greenway, Gary Hollis, Scott Grant, Carol Pammer, Jenny Nicoll, Kim Armstrong and Cherie Jenkins. One year on and a steep learning curve about the museum and volunteer management. I have met a great group of people and for that, I thank you one and all. I have appreciated the variety of backgrounds and knowledge that I could draw on for advice on almost any challenge that I have been faced with. Teamwork has been a priority and as a group we have achieved many projects including general administration, developing formal documents such as mission statements, grievance policy and standard operating procedures for museum reception. The new web site and Facebook is really opening up for us the social media world and electronic banking is making accounting and bill paying easier. 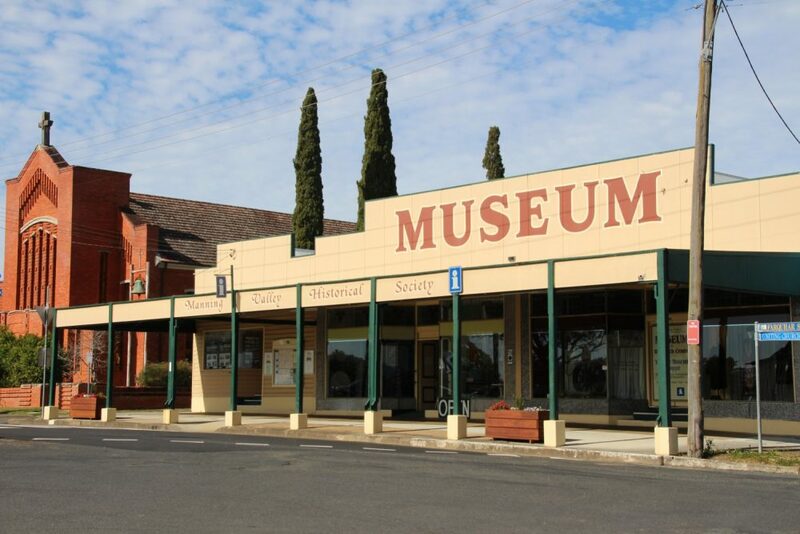 A collection management committee has been established so that items donated are assessed for providence and historical connection to Manning Valley and now there is no item coming in or leaving our organisation that isn’t accounted for. When an item is being donated, the donor completes and signs a ‘Deed of gift with Transfer of Ownership’ form which transfers ownership of the item to the museum. On acceptance, each item is accessioned and a decision made as to whether the museum can accept it. There is, however, a box which the person can tick if they would like the item returned to them if the museum is unable to use it. Items which cannot be used by the museum, and are not wanted back by the donor, are decommissioned and approved for auction by the Collections Management Committee. After being sold, a commission is paid and the rest of the money is donated back to MVHS. 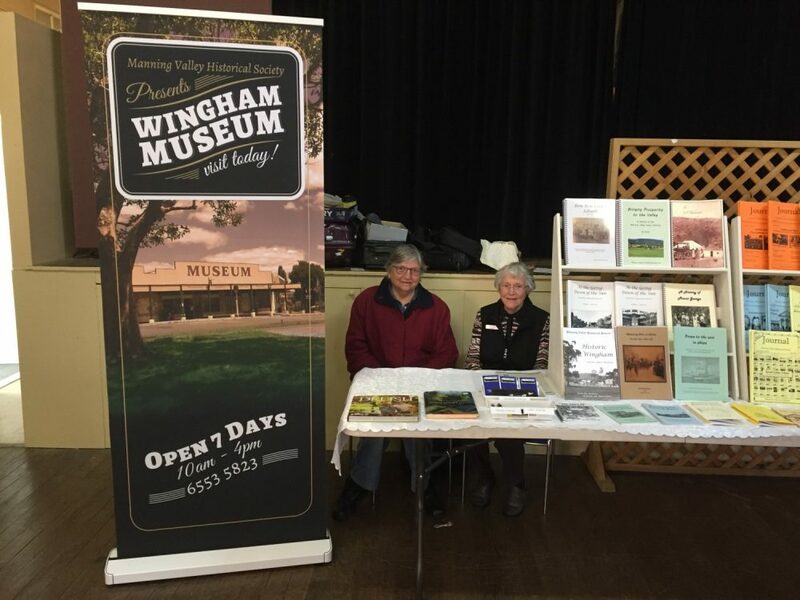 This process is closely monitored and because of limited storage capacity we only accept items in reasonable condition which have connection to the Manning Valley, with a significant providence to a local family, a local event or items which were in general used by our pioneers. 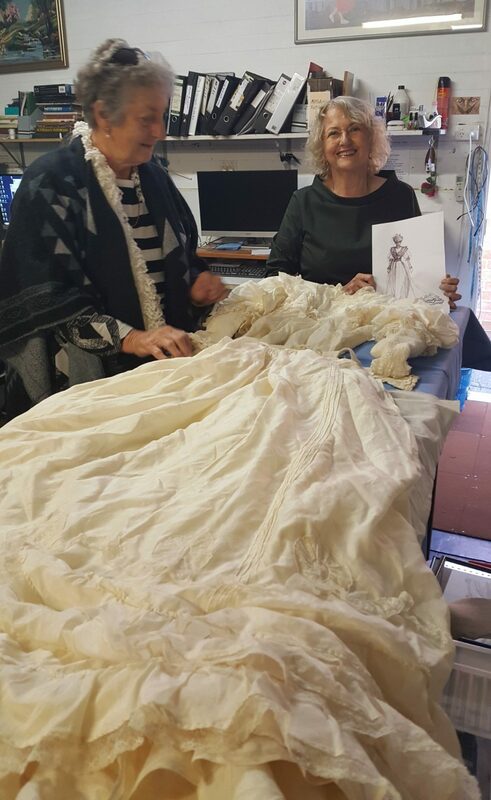 Carolyn Lynch and Elizabeth Robinson called in recently to view their relatives wedding outfit which is a skirt and blouse made of silk and intricate lacework. 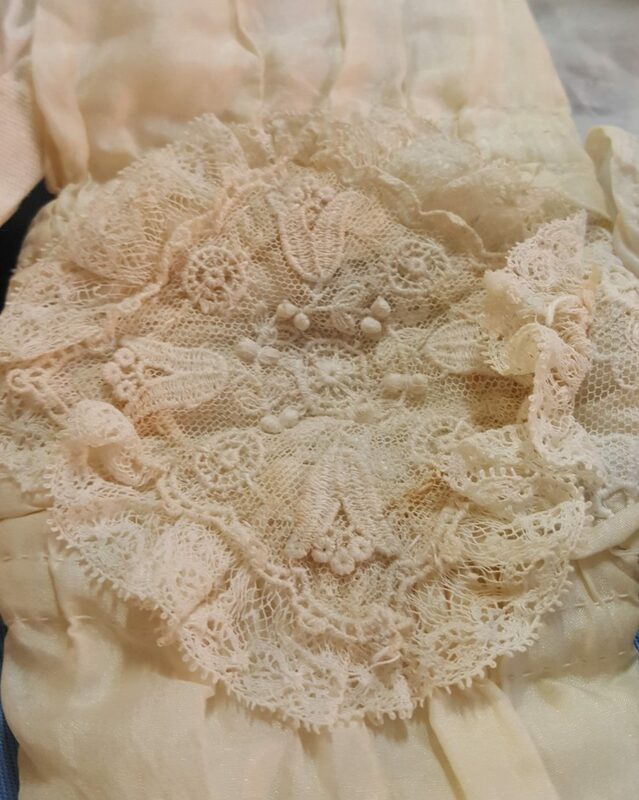 It was worn by Alice Mary Chapman for her marriage to Walter Stephen Cooper in 1906. A great love story, as Walter was devoted to Alice all his life. The ensemble is fragile but in great condition and is stored in acid proof tissue paper and archival box. We have a grant pending for a compactus which is a new storage facility for our workroom. This will enable clothing to be stored in environmentally controlled conditions free from dust, pests and mould. 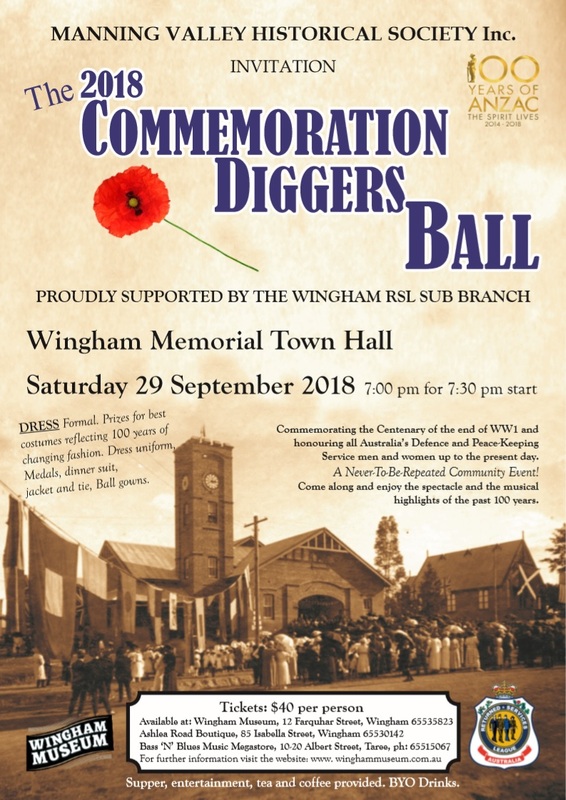 Diggers Ball… Wingham Memorial Town Hall, Saturday 29th September. Tickets are selling well, so now is your chance to organise your table and buy them before they are sold out! 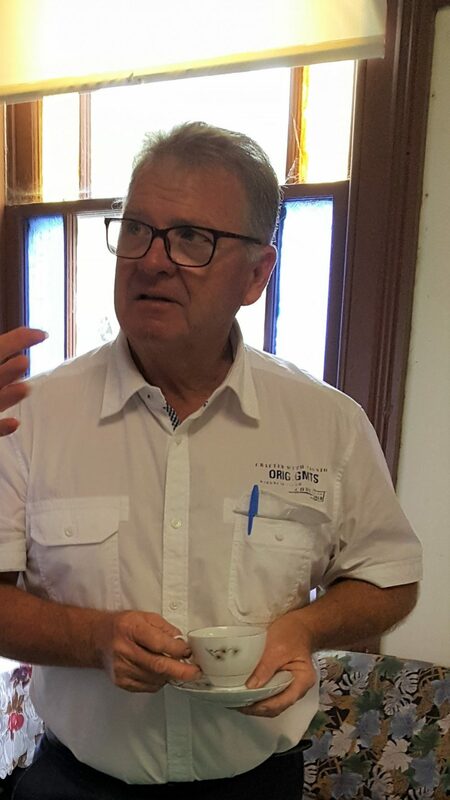 Ian visited recently with the Taree Probus club and spent some time looking through our tool section. Ian was an apprentice builder and also worked for Bill Kennedy in produce. His father Bill Ferguson won medals for butter making at Gloucester, c 1920’s. The butter was sent to London for judging. Museum Maintenance- The front room which incorporates museum reception will be undergoing a makeover. Wall divisions will make new rooms which will improve display spaces. Bob Berry is currently working with students of Tinonee Public school to create a papier-mâché tree for our timber getting display. Another improvement are new floors for the displays in the Wingham town area. ‘McLennan Families on the Manning’ compiled by David Freeman. 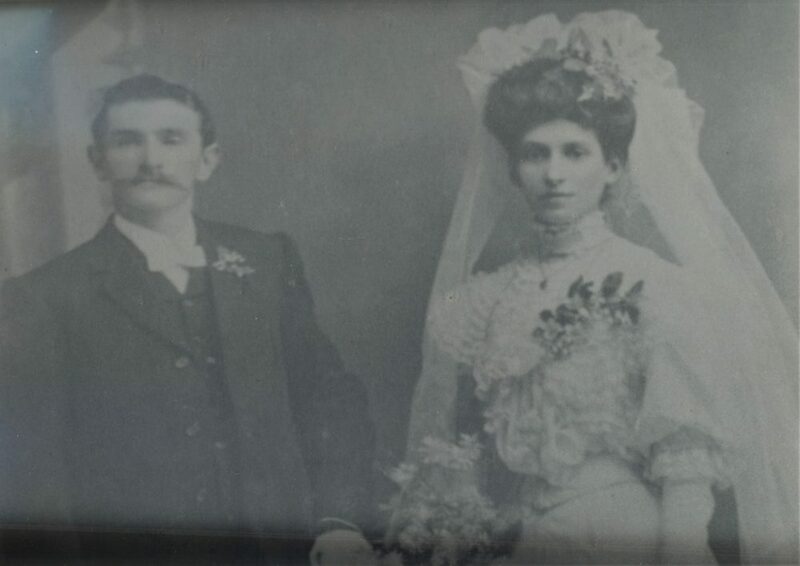 This is the history of three McLennan families from Scotland who settled in Taree between 1841 and 1845 as well as other McLennans who settled in Manning Valley and surrounds. Pictured are Kathie Bell and Carol Pammer with our book stall at Killabakh ‘Day in the Country’ on 1st September. We have a new museum banner which is pictured on the left. A grant enabled us to have 3 other banners made depicting pioneering women in the Manning Valley. These depict Ella Simon, Isabella Mary Kelly and Nancy Bird Walton. These are soon to be displayed in our front windows.